Availability: Available easily in all offline beauty shops, also buy online beauty stores like flipkart, jabong. Now hydration and shine meet lasting, lightweight color. With shine Caresse. Discover a lip gloss that doubles up as a lip stain. This next generation lip colour combines the texture and shine of a gloss with the long wear bility of a stain. It delivers a lasting colour with a subtle glossy shine. The packaging is pretty and compact with gold colour cap and bottom, in the middle there is a transparent gap to see the shade of gloss in the tube. It is very travel friendly. I love this applicator and it is very friendly when it comes to apply flawlessly on the lips because of its leaf shape which can cover nook and corners of your lips. It is easy to mix and spread the lip stain on the lips well on the lips by the provided lip gloss applicator and it is very soft too. The shade is a pretty bright fuchsia pink which can look good on all skin tones. This shade will look good on both day and night time, as well as with any outfit. I would say this Eve shade is a gorgeous shade in this L’Oreal Paris Shine Caresse Glossy Stain collection. The shade can cover any pigmented lips and show it very beautiful. The texture is creamy and thick also pigmented well. I am loving this shade very much and started wearing it often when I am going out. This shade is best for summer looks. I have normal lips and I have no dryness problem, so mostly I won't use lip balm underneath. But, my upper lips are bit pigmented and dark brown in colour. but, this Eve shade covered my ugly pigmented upper lips and made it gorgeous. The L’Oreal Paris Shine Caresse Glossy Stain Eve finish is glossy. I have no problem in spreading this lip stain over my lips. 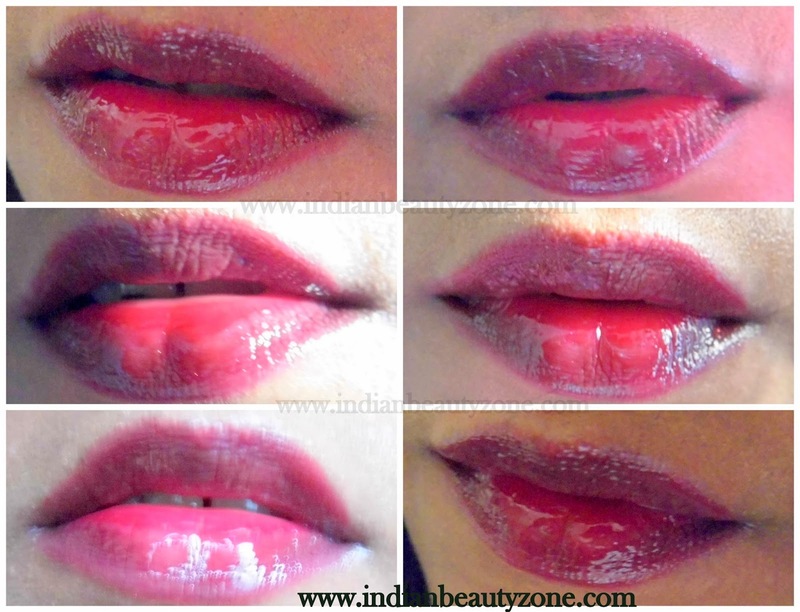 L’Oreal Paris Shine Caresse Glossy Stain Eve stayed on my lips for solid 5 hours time. Later it left a pink stain and little dryness on my lips. But after 5 hours this is not a big problem at all. I had small meal and this lip stain had stayed on my lips very well without getting transferred. I love the smell of this lip gloss very much, it is so pleasant. Overall it is a totally worth lip product from L'Oreal. I have created a neutral eye look with this bright L’Oreal Paris Shine Caresse Glossy Stain Eve shade. 8 Beautiful shades to choose. Stays for 5 to 6 hours. If you have very dry lips, the shade might look uneven on your lips. Makeup beginners may mess up with this shade if not carefully applied.